I suppose no one else noticed or cares, but long after drawing this toon, I realized that I had accidently installed FrobozzCo Magically-Expanding Wall-Squares in the elevator. I'd have them ripped out and replaced, but it's just too expensive. Somehow, we'll all just have to muddle through. 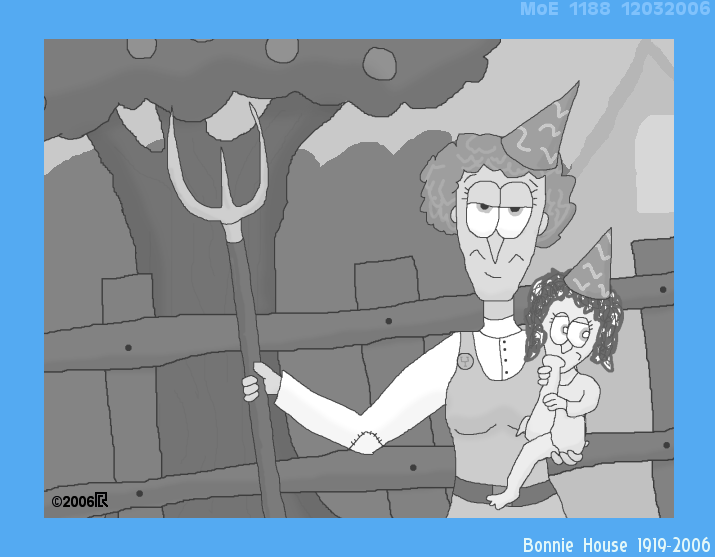 Today, a nifty birthday-themed guest strip by W. M. Sonnenburg, a relative newcomer to the Keenspace family with her fantasy webcomic A Hole In The Sky. Check it out; so far, it's a world which I think fans of the MoE will enjoy visiting. (Strange and odd characters, lots of unanswered questions, extremely unhelpful talking trees...) Thanks to W.M. for the art and the link! And yes, as it happens, Rosemary really was living with Aunt Eva when she was two. The name (although not the personality) of Rosemary's Aunt Eva was inspired by a real-life woman whom I knew and was very fond of, and who passed away this week after a long and productive life. So, as my tribute to Eva "Bonnie" House, here's the daguerreotype of Eva Ripley which her niece always carries with her, as originally detailed in a guest strip by former ComicGenner W. M. Sonnenburg. Yes, I sometimes officially incorporate info given in guest strips into the "real" comic. This strip is a replacement. If you want to see the original, click here. Since people are no doubt wondering, "Brushstrokes" in this instance is a profanity, roughly equivilent to "Christ!" While I assume you can figure out on your own why an underground critter who lives in a fairytale world might not be making references to Jesus Christ, the reason this particular word is used instead is... a subject that will be discussed in-strip. Eventually. I hope. For those who don't know or remember, Chauncy and Edgar were introduced back here. Note added summer 2009: I now consider this sequence to be an Official Mistake, and things have Changed. In future, Ghasts will not be able to so easily re-assemble themselves, and Oozes cannnot sploosh themselves around with such reckless abandon; for any D&D enthusiasts in the crowd, they are both more like Shambling Mounds than Black Puddings. Today's strip is my contribution/tribute to Online Comics Day! Hit the link and check out some of the many many other webcomics that are out there! For those who are confused, Rosemary and Sylvester made a trip through the "twistpoint" in question, starting with this comic. Rhid, on the other hand, is an all-new arrival on the general scene. A certain milestone. As I noted back last October, all along I have been posting a varying mixture of new and old strips, the latter originally having been displayed in a very crude archive on my personal website where no one ever read them. When I moved to plusher and better-advertised digs here in Keenspace/Comic Genesis, I rebooted from Strip One, and massively expanded the storyline and character roll as I reposted, replaced and/or filled in. Today's strip is the very last "re-run" from the old days; from here on out, it's all new. So if the drawing quality drops off now, I did have a stroke. Or got even more lazy.